Disassembled is a futuristic stationary wave shooter for Oculus Touch where you to move up the ranks by surviving an invasion of carnage against wacky robots. As you progress you'll be able to purchase and improve your arsenal and defenses. At the beginning of the stage you'll have time to prepare your defenses, and then try to survive the round. Disassembled is one of the better arena wave shooters for Oculus Touch in my opinion. 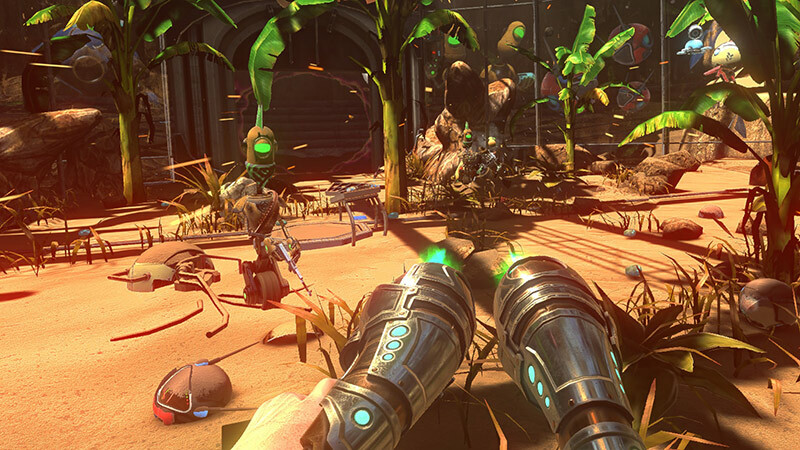 In this VR game, you are trying to survive against a horde of wacky robots. You'll be earning cash as you progress through and you can use it to buy new guns from the gun Store or defense items from the Defense Store. In each episode you'll be facing different types of enemies, some will spawn at the first waves, other at later rounds in the level. Each kill grants you cash, which varies based on the type of enemy you kill. 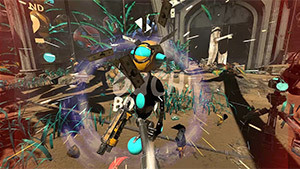 For example, in the first level called "Alpha Sector 1 Jungle" you are facing three type of enemies: Scooter (spawns in wave 2-4, kill grants $30), Buggbot (spawns in wave 1-4, kill grants $10) and Sparky (spawns at wave 4, kill is worth $40). You can see that information on a large chalkboard before going into the mission itself. There might be some enemies at higher waves that the game doesn't tell you about and keep it as a surprise, those are marked in a question mark but you still get to see which wave they appear and how much a kill is worth. After you finish a level, you unlock the next one. In the "Study Bot" drawer you have the option to learn more about the robots you are going to fight against. It's a good opportunity to learn about their strengths and weaknesses, so you know how to target them in order to deal the maximum amount of damage and thake them out as fast as possible. You'll be able to learn about their fire-rate, the amount of damage they deal, their weak spots, etc. One of the cool things about this game is the option to try out a nice variety of weapons and defense items (e.g. anti-air turret) as well as the option to purchase minions in the defense store, with those minions fighting alongside you in the arena. Of course, it's essential to upgrade your arsenal in order to be able to survive against tougher enemies at higher levels. The first-person shooting mechanics work really well: easily manageable, responsive and accurate. You just grab your weapon or weapons and start shooting those robots that spawn all around you. I've seen some people playing it on the HTC Vive using the ReVive and they said it worked fluently. It's a challenging game and you can feel the need for better firepower even at the first level. Aiming is very important as well. Just don't forget those weak spots that I mentioned earlier, learn them well because it will make it much easier to clear a round if you know how to take those robots fast. Also, make sure you bring the best weapon for the job so you can clear them out faster. As you progress you'll also be earning trophies for high scores and you can see them in the cabin where you first start the game in. The graphics in this game are top notch. The arena designs are beautiful and rich in details. This is important because your character is stationary so it's nice to have a detailed environment in front of you to enjoy as you smack those little robots butts. Speaking of which, the design of the robots is what grabbed my attention in the first place. Some of them are really cute-looking yet they are annoying and can be very deadly, especially when they come in masses, so don't let their cute look mislead you. I think the robot's designs is one of the things that really makes the game fly. If those robots had simple geometric-shaped bodies it just wouldn't be the same experience, although some robots do look cooler than others. The sound in this game is very well made and amplifies the whole shooting experience. It becomes really intensive once you spawn a turret and throws a few minions into the battlefield. Although you are fighting in a very small arena, it really feels like you are in the middle of an intense battlefield. It's a charming little shooter that sports some really heavy punch. Although you are stationed in the same place, you still get to experience and feel that accelerated shooting experience because the conflict happens 360-degrees all around you. Disassembled rightfully earns our Impressive VR Game award. I highly recommend checking it out if you own the Oculus Rift headset. As mentioned on the Steam page, the game will be released The game will be released on August 31, 2017. 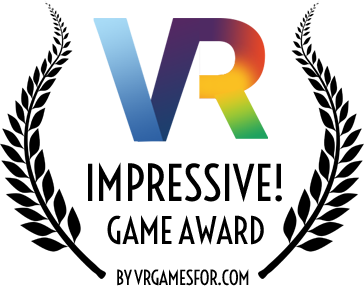 Also, remember the developer's name, Reversed Interactive, I'm sure we are going to see more amazing games from this game studio. This preview is based on an early access release. The full release might add more features that we haven't mentioned here. You can find out more about the game by visiting the official game's page on Steam or via the developer's website at reversedint.com. August 30, 2017Our preview is out now, read more about this great wave shooter for Oculus Touch!